Get these Green Animal Print Geometric Prescription Frames (220124) for only $6.95! You sure don’t need anywhere near 82 million dollars to get star quality looks from Zenni! All of the prescription and non-prescription eyewear on this page ranges from just $6.95 – $23.95 and you can click on any of the images for more info and details. The $6.95 frame above has a lot of personality, just like Dennis Rodman, and it’s in a geometric lens shape that he wears in different styles of glasses. For another shape that Rodman’s been photographed wearing, check out these glasses that feature a brown frame and an amber gradient tint. Get these Men’s Non-Rx Silver Rimmed Sunglasses (A10110512) for only $23.95! 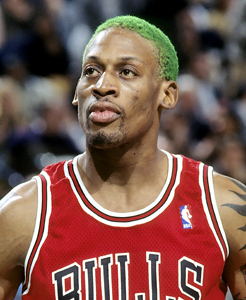 Rodman likes his metal whether that’s hoop earrings, nose and lip rings or metal-rimmed glasses. He also wears both silver and gold metals, but seems to wear more silver. Zenni has many frames that have several different color options. The choices be in metal color as well as lens tint and temple arm details. If you really love how a frame style looks on you, it’s great to be able to also purchase the same one in different detailing options. Get these Men’s White Plastic Rim Frames with Checkers (489430) for only $23.95! Rodman sometimes wears white-rimmed sunglasses similar to these Zenni stunners above although he seems to typically wear darker frame colors and metallics more than white. We think the checker detailing would be a nice look on him, but if you play chess or checkers that’s a great one for you too. Remember that virtually any Zenni frame can be turned into sunglasses by adding a tint in grey or amber to your order for just $4.95. Get these Men’s Non-Rx Half-Rim Sunglasses with Grey Lenses for only $9.95! Dennis likes to wear both amber and grey sunglasses as well as other colored tints from time to time. The Zenni sunnies shown above features grey lenses with a black frame, perfect for any occasion. Get these Unisex Silver Prescription Aviator Frames (419011) for only $4.95! Along with mostly rectangular and geometric shapes of sunglasses, Dennis Rodman does wear a few aviator styles occasionally that are very similar in looks to the Zenni silver frames above. This style suits men and women of many different face shapes and skin tones. You have the option of adding tint to a frame like the 419011 above or buying the matching set of prescription frame with clip-on sunshade like the double duty 583411 frame.